"I actually think they want to kill me!" Writer/director Stephen Gallagher put together this British telefilm in the late 1990s, using his own novel as the basis for the screenplay. It's a thriller about a schoolteacher who accidentally finds himself as a rogue lab experiment, battling a huge corporation that has developed a bizarre new drug with some very dangerous and deadly side effects. There's plenty of X-Files-ish "trust no one" undertones present here, and as a made-for-television project, Gallagher manages to tell a fairly engaging conspiratorial thriller with a science angle, using a bare minimum of action pieces. Stephen Tompkinson is the teacher-turned-experiment Jim Harper, a puppy-eyed innocent who is attracted to the older sister of one of his students. The fact that the object of his desire (played with a detachment by Lydzia Englert) is a cold, calculating bigwig of the villainous Risinger-Genoud corporation goes completely unnoticed by him. That's bad news for Jim, because after using some phony credentials to get into a top-secret seminar at a Swiss mountaintop laboratory, he's jabbed with the mysterious drug EPL, which a prologue sequence reveals causes mind-altering shared experiences across users, whether human or animal. As with most thrillers, it's one man against the world, and here the question is whether Jim will be able to stop the mass release of this so-called "gift from God" drug and bring down Risinger-Genoud. There are the occasional lazy stretches in the writing—including the dreaded "character searching for another character in a big city by driving around randomly in a cab and just happening to find them" and the "how did that character get back to the top of the secure mountaintop laboratory without being seen" sequences—and those kind of sloppy connect-the-dots moments always leave a bad taste in my mouth. It's a shame, because Gallagher has the skeletal structure of a good thriller here, and he gets a boost from a properly scattered and frantic performance from Stephen Tompkinson. One generally has to lower their expectations when it comes to television vs theatrical features, especially when it comes to thrillers, because typically TV budgets are a fraction of the big studio releases. That's certainly the case here, but Gallagher largely sidesteps the need for any real big action scenes, and the basics of the story work well enough within those tighter budgetary limitations. We get the requisite evil henchman as the main adversary, as well as some spooky dream-like sequences, including a bloody merry-go-round bit that keeps the mood dark in lieu of big money effects shots. Plus, he avoids going for a completely happy ending, and that is almost enough to make me forget the parts that skimped on logic. Image Transfer Review: Oktober has been issued in its original 1.33:1 broadcast ratio, and the print itself is unfortunately marred by some excessive specking that is more prevalent during the final act. Some minor shimmer is evident in spots, as well. As for the colors, they've held up fairly well, reproduced here looking only slightly muted, but remaining consistent throughout. Audio Transfer Review: Audio is presented in 2.0 stereo, and it's a modest but serviceable frontcentric mix. Dialogue is generally clear at all times—though some levels seemed inconsistent—and there is some minor left and right directional cues properly widening the soundstage. Extras Review: Not much in the way of extras, and all that's included here are some onscreen text-based choices. 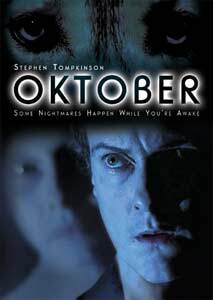 There's a bio of author/director Stephen Gallagher, as well as a set of his production diary notes outlining his trials and tribulations while making Oktober. Also included is a filmography for actor Stephen Tompkinson. The disc has been cut into 23 chapters. This made-for-British television thriller from 1998 is not your typical big-budget action film full of elaborate set pieces. Instead, it relies more on fistfights and creepy dream sequences, operating fairly effectively on the old "everyman against an evil corporation" premise. There's a nice performance from Stephen Tompkinson as the hero, played here with the right amount of exasperation and fear, that ends up being the selling point. The disc doesn't offer much else other than the feature, but it's worth a rental for thriller fans looking for something a little different.